Humanity for Palestine has reported that, since the ceasefire agreement of August, 2014, Israel has committed 94 ceasefire violations. The latest was Saturday’s airstrike in Khan Younis, along with an attack on Gaza fishermen.On August 26th, Israel and the Palestinian Authority, acting on behalf of the Palestinian people – including those living in Gaza – agreed to a ceasefire to end the massive Israeli assault and the indigenous resistance. The opening of Israeli crossings into and out of Gaza, allowing the flow of human traffic, humanitarian imports and commercial trade. Extension of fishing limit off Gaza’s coast from three to six miles, with discussions in one month about extending it further. Reduction of the “security zone” inside Gaza from 300m to 100m. Resumption of Egyptian-brokered talks by Sept. 26 to discuss release of prisoners, seaport/airport and other remaining issues. However, in the approximately three months since then, Israel has violated the truce repeatedly – including 33 times in which Israeli soldiers opened fire on Palestinians, injuring 16 and killing one. Since the ceasefire was called, no more than a week has passed without Israeli fire at Palestinian protesters, farmers or fishermen. Yet only one rocket has been fired from Gaza, for which Hamas claimed no responsibility. Meanwhile, no resumption of negotiations toward a longer-term, more permanent truce and a just, peaceful co-existence has occurred. 12/3: A Palestinian fisherman was critically injured after Israeli warships fired several shells toward the coast near Gaza City. Nizar Ayyash, head of the Gaza fishermen’s union, said fisherman Fakher Nizar Abu Riyaleh, 32, was critically injured in the head by shrapnel from Israeli shells. Abu Riyaleh was taken to al-Shifa hospital for treatment. 11/30: The Israeli army opened fire on agricultural land at the edges of Khan Younis in the south of the Gaza Strip. Eyewitnesses reported that the army deployed at the Kissufim military base fired electromagnetic bombs on farmland, causing mild damage to crops. 11/29: A 16-year-old Palestinian boy suffered a shooting injury after approaching the security fence by Beit Lahia in northern Gaza and allegedly ignoring IDF warning shots for him to back away from the spot. He was evacuated to a hospital after IDF forces shot him in the leg. 11/28: A Palestinian was injured in his right foot after Israeli forces opened fire near the border east of Jabaliya. 11/27: Shots were exchanged between Israelis and Palestinians in Gaza, after the Israeli army claimed that an unidentified gunman in fired at and struck an IDF jeep as it carried out a routine border patrol in the area of Kibbutz Be’eri. No one was injured. 11/23: Israeli forces shot and killed Fadel Mohammed Halawa, 32. He was reported to have been searching for songbirds that nest close to the boundary with Israel, east of the Jabalya refugee camp. The spokesman for emergency services in Gaza said Halawa was shot in the back. 11/23: A teenager was seriously injured and two others were arrested by Israeli forces when they approached the border near the Kerem Shalom crossing. Medical sources said a 17-year-old known as A.K. was shot by Israeli forces near the crossing and taken to Abu Yusef Najjar hospital in a serious condition. 11/19: Israeli naval forces opened fire on Palestinian fishing boats off the coast by the town of Rafah, with no casualties reported, according to head of Gaza’s Palestinian Fishermen’s Union Nizar Ayyash. 11/16: Israeli soldiers stationed at a watch tower near the Kissufim military base opened fire at a Palestinian, critically injuring him. 11/10: In the second incident in less than a day, the Israeli navy opened fire on a Palestinian fishing boat off the coast of the Gaza Strip, reportedly destroying it. The boat was on its way back to Gaza from Egypt, where it had picked up supplies. The Israel Defense Forces claimed that a smuggling attempt had been foiled. Several fishermen were seen jumping into the water, and two fishermen were reportedly injured in the incident. Four were missing and may have been arrested. 11/9: Israeli troops stationed on the Gaza border opened fire with machine guns and projectiles at agricultural land to the southeast of Al-Baraj refugee camp. In addition, the Israeli Navy fired on a fishing boat that it claimed had made it to Egypt, taken on cargo and returned. Witnesses said Israeli forces shot at the boat until it took fire, and that fishermen in a nearby boat managed to pull the three injured men aboard. The injured fishermen were taken to Abu Yusuf al-Najjar Hospital in Rafah. 11/7: Israeli troops guarding the Gaza border fired at a group of protesters, wounding one of them. On the same day, warning sirens sounded in Israeli towns near Gaza. However, the rocket landed inside Palestinian territory. 11/5: Israeli troops deployed behind the border fence was of the Qarara district in Khan Younis fired sporadically at Palestinian homes and agricultural property with machine guns and “flashbang” grenades. No injuries were reported. 10/31: A single rocket reportedly landed in Eshkol Regional Council, southern Israel. No injuries or property damaged was caused, and none of the Palestinian factions claimed responsibility. Yet it triggered an indefinite border closure and F16 forays. Gazans suspect a false-flag operation. 10/28: The Israeli navy targeted Palestinian fishing boats with gunfire offshore the coast of Gaza. No casualties were reported. 10/22: Israeli forces opened fire on two boats carrying seven fishermen. Five fishermen from the Bakr family were taken into custody for questioning and their boat was dragged to an unknown location. 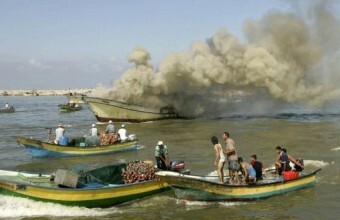 10/16: Israeli boats opened fire at boats belonging to local a fisherman off the coast of Deir al-Balah. The boat belonging to Jamal Abu Watfa was sunk in the attack and he lost consciousness, but was saved from the water. 10/11: A 24-year-old civilian was injured by Israeli fire approximately 300 meters from the border in Beit Lahia. 10/9: Israeli army forces stationed at the Kisovim military post opened fire on Palestinian farmlands in Khan Younis in the southern Gaza Strip. No injuries were reported. 10/7: Navy ships and a helicopter opened fire close to a number of fishing boats in the al-Waha area, in northwest Gaza, causing damage but no injuries. 10/1: Twelve military vehicles entered Gaza from a gate east of the town of al-Fukhari in the Khan Younis district. The vehicles reportedly crossed some 200 meters into the Strip, and soldiers scanned the area before shooting towards Palestinian farms. Agricultural workers were forced to leave their fields when soldiers shot. 9/29: Rajab Maarouf, a 22-year-old farmer, was shot in the foot in northern Beit Lahiya and taken to Kamal Adwan hospital with moderate injuries. 9/22: Israeli gunboats opened fire at a Palestinian boat carrying five fishermen off the Al-Zahra shore, southwest of Gaza City. The five men were forced to jump into the water and swim to the Israeli ship, where their hands were bound and they were taken to Ashdod Seaport. They were freed the next day, but their boat was not released. 9/17: Israeli naval forces opened fire off the coast of northern Gaza, moderately injuring fisherman Yousef Zayif, 70. 9/16: A single rocket was fired from Gaza into southern Israel, but was not claimed by any Palestinian faction and no injuries/property damage resulted. 9/14: An Israeli war ship fired “warning shots” at Palestinian fishermen off the coast of Gaza City’s Al-Shati refugee camp. 9/12: Israeli navy forces opened fire at Palestinian fishermen off the coast of Beit Lahiya to the north. 9/11: Four Israeli bulldozers entered a border area in southern Gaza, near the village of al-Qarara, and leveled private Palestinian land. Military vehicles accompanying the bulldozers fired shots, with no reports of injuries. 9/9: Israeli naval forces detained two Palestinian fishermen from the Al-Sultan family, Tariq (18) and ‘Issam ‘Abdel Bari Mohammed Bahaa’ Yousif Mohammed (21), just 1.5 miles from the coast of Beit Lahiya in the northern Gaza Strip. Their boat was confiscated and the men were arrested. An hour and a half later, gunned down the fishing boat of two other Al-Sultan brothers – Bahaa’ Yousif Mohammed (25) and Ahmed As’ad Mohammed (22). They too were arrested and their boat was confiscated. 9/8: Israeli military fired on fishermen, pushing them back to a five-mile limit. 9/5: Israeli military opened fire on two fishermen and arrested them. 9/3: Israeli gunboats opened fire at Palestinian fishing boats sailing within one nautical mile off the shore of Beit Lahia. Soldiers forced two fishermen, Mohammed Ishaq Mohammed Zayed (18) and Mousa Talal ‘Ata Al-Sultan (24), to jump into the water and swim toward the Israeli gunboat. 9/2: Israeli military opened fire with machine guns on Gaza fishermen. 12/1: A total of 442 trucks of food and basic supplies went into the Gaza Strip, the Office of the Coordinator for Government Activities in the Territories said in a statement. 11/26: At a press conference in Gaza City, Dr. Faisal al-Shawwa, chair of the Private Sector Coordination Council, said that Gaza’s private sector had rejected the UN-backed reconstruction agreement from the start. Al-Shawwa said that the mechanism amounts to a plan to administer Israel’s siegeand paralyzes, rather than facilitate, reconstruction, the Ma’an News Agency reported in Arabic. Al-Shawwa said that Gaza needs the complete opening of all the crossings in order to rebuild in three years, but that under Serry’s mechanism it would take far longer. While calling for a full effort to lift the siege, Al-Shawwa urged the UN to take responsibility for rebuilding destroyed homes using a tendering mechanism that existed prior to the summer attack. 11/26: The Israeli group Gisha reported: The current need for construction materials is estimated at 5 million tons, mostly for restoring homes and basic infrastructure. Between Aug. 26 and Nov. 20, however, only 62,928 tons of construction materials entered Gaza, just 1.2 percent of the overall need. And the majority of that small amount (59,592 tons) is reserved for international humanitarian and Qatari-funded projects. Although the private sector plays a very important role in both the restoration of buildings in the Gaza Strip and in its economic recovery, as of 20 November 20, only 3,336 tons of construction materials entered Gaza for the private sector. 11/25: Raed Fatuh, the Palestinian Authority official in charge of the entry of goods into Gaza through the Kerem Shalom border crossing, said 28 trucks, each loaded with 40 tons of cement, crossed into Gaza.”This is the biggest delivery of cement since the war ended,” he said. “But it is not enough, it is only a tiny amount for the reconstruction.” Fatuh added that it is not clear whether Tuesday’s delivery of building materials is a one-time transfer or it would continue. Palestinian officials maintain that 100 trucks of building materials a day are needed to rebuild Gaza Strip within three years. 11/24: Israeli authorities barred, at Kerem Abu Salem crossing, 10 truckloads of agricultural products from passing out of Gaza to the West Bank and Saudi Arabia, due to a dispute between the Israeli army and the Palestinian Ministry of Agriculture. 11/22: Palestinian Minister of Civil Affairs Hussein al-Sheikh announced that the next week would see the second round of construction material and equipment entering the Strip. The announcement came only days after UN authorities said that nearly 30,000 Palestinians were still living in temporary shelters in Gaza, even as rain caused flooding and further hardship for thousands of families displaced by Israel’s summer assault. Al-Sheikh said this second phase of construction materials would be the biggest, and that materials would reach 24,000 families. 11/18: Jens Toyberg-Frandzen, a senior UN official, announcedthat just 1,086 people in Gaza had so far been able to buy building material under the “temporary Gaza reconstruction mechanism.” The material delivered to date included 10,416 bags of cement (of a need for 1.5 million TONS). Israel allows only 350 trucks of building material into Gaza per day, although it has reportedly agreed to raise that limit to 800 trucks. Under the “reconstruction mechanism” forged by the UN with the PA and Israel, Gaza’s residents may buy cement and other material from designated vendors. This means that ordinary people are being required to pay for rebuilding homes that were attacked by the Israeli military. 11/17: Deliveries of reconstruction material to Gaza have started, announced the Palestinian minister of civil affairs. (This is CONFUSING. Previous reports announced the same thing. So?) Some 100 trucks carrying 4,000 tons of supplies for Qatar-financed road repairs were expected to enter on Nov. 17. He said asphalt would enter the Gaza Strip the next day, and that it has been agreed with the Israelis to allow 100 trucks of road construction materials per day to cover the needs of rebuilding. Hussein Al-Sheikh added that clothing exports from Gaza to the West Bank also are beginning. 11/10: Israel allowed two Gaza businessmen (fishmonger Munir Abu Hassira and his business partner) to export fish to the West Bank for the first time since 2007. The shipment of more than 730 kilograms of fish marked a symbolic easing of a longstanding Israeli blockade on the Gaza Strip. Gaza used to ship up to 1,200 tons of fish to the West Bank each year before the blockade. 11/6: For the first time since 2007, a truck carrying 10 tons of cucumbers grown in the Gaza Strip was allowed by Israeli authorities to pass through the Kerem Shalon headed for Hebron in the West Bank. 11/4: Israel re-opened its crossings. Palestinian officials reported that 330 truckloads of goods and one truckload of cement (just ONE????) now will be allowed in. 11/2: Israel indefinitely closed its two crossings into Gaza in response to a single rocketfrom Gaza that was not claimed by anyone and did not cause any injury or damage. 10/27: The United Nations finally announcedthat after two weeks of sitting in “off limits” in warehouses, the still-insufficient building supplies that had made it into Gaza could finally be used. However, it was not until 11/4 that Robert Serry, the United Nations special coordinator for the Middle East peace process, announced that its reconstruction effort had begun in Gaza, with 700 families being allowed to purchase materials to repair their homes. Seven hundred is just a fraction of the 60,000 homes that need repairs or to be rebuilt. 10/26: Gishanoted that Israel has made official several (very) small improvements in the volume of human traffic allowed in and out of Israel via Erez: a) a daily quota of 20 non-urgent medical patients, b) issuance of 250 biometric cards that allow expedited travel for business people and merchants, c) visits to up to 50 prisoners in Israeli jails a week (three immediate family members per prisoner, compared to four previously); d) an increase in the quota of crossing permits issued for Palestinian employees of international organizations of 600, bringing the total to1,000 (300 additional permits for employees between the ages of 25 and 28 and 300 for employees older than 28); e) permission for 50 medical personnel to travel to the West Bank and Jerusalem for training, per month; and f) travel permits for members of the Palestinian national soccer, basketball, table tennis and running teams; representatives on the Olympic Committee; and officials in the national unity government. 10/25: The New York Times reportedthat truckloads of cement, steel and travel remain locked in Gaza warehouses, unavailable to thousands of families who are desperate to fix their homes. The supplies cannot be distributed until a monitoring system to prevent them from being diverted to Hamas is in place. 10/14: Shortly after UN Secretary-General Ban Ki-Moon attended the Reconstructing Gaza conference in Cairo, Israel allowed 75 trucksof construction materials into Gaza. 10/8: Palestinian border authorities reportedon Oct.7 that Israeli authorities delayed indefinitely the entry of 60 truckloads of building materials into the Gaza Strip. The next day, it was announced that Palestinians would be able to begin importing reconstruction material into the Gaza Strip through Israeli-controlled Kerem Shalom crossing starting the following week. 9/16: Gishareported several slight improvements: an increase in the age of children allowed to accompany parents on humanitarian visits from 6 to 15, a daily quota of 200 merchants permitted to exit Gaza and an increase in the overall number of merchants cleared for exit to 2,000. The Kerem Shalom crossing has returned to function “exactly as it did prior to the kidnapping and murder of three Israeli youths in the West Bank in mid-June.” (In other words, no improvement.) Israel has begun allowing construction materials destined for international aid organizations and the Palestinian Water Authority, but the amounts are “a fraction of what is needed in order to advance reconstruction at a reasonable pace.” Some goods also were exported out of Gaza for the first time since June – two trucks carrying 8.3 tons of sweet potatoes en route to Europe. From the beginning of the year until the end of August, Gaza exported 11 truckloads per month on average – less than 1% of the monthly average before the closure was imposed in 2007. 9/3: Meanwhile, EU sourceshave revealed that Israel is profiting from reconstruction efforts in the Gaza strip by effectively blocking all non-Israeli building material (primarily steel and cement) into the enclave. While no formal Israeli ban prevents the importing of reconstruction materials made outside Israel, EU sources speaking on condition of anonymity say that in practice, Israeli security demands mean that a de facto ban is in place – thus increasing construction and transaction costs and fattening the coffers of Israeli middlemen. 12/7: Israeli forces detained 12 Palestinian fishermen from five boats near the al-Sudaniyya area off the coast of the northern Gaza Strip. Forces first detained Mahmoud Zayid and his brother Ahmad from Beit Lahiya. They then detained three more fishermen from Gaza City and later six more. The men were arrested and the boats were confiscated, taken to an unknown destination. 11/9: The Israeli Navy fired on a fishing boat that it claimed had made it to Egypt, taken on cargo and returned. Witnesses said Israeli forces shot at the boat until it took fire, and that fishermen in a nearby boat managed to pull the three injured men aboard. The injured fishermen were taken to Abu Yusuf al-Najjar Hospital in Rafah. 10/22: Israeli forces opened fire on two boats carrying seven fishermen. Five fishermen from the Bakr family were taken into custody for questioning and their boat was dragged to an unknown location. An Israeli spokesperson claimed the Palestinians were 1.8 nautical miles beyond the permitted fishing zone. 10/16: Israeli boats opened fire at boats belonging to local a fisherman off the coast of Deir al-Balah. The boat belonging to Jamal Abu Watfa was sunk in the attack and he lost consciousness, but was saved from the water. The financial losses to the fisherman could reach more than $140,000. 9/22: Israeli gunboats opened fire at a Palestinian boat carrying five fishermen off the Al-Zahra shore, southwest of Gaza City. The five men were forced to jump into the water and swim to the Israeli ship, where their hands were bound and they were taken to Ashdod Seaport. They were freed the next day, but their boat was not released. The men: Sofia Mohyi Al-Deen Kollab (47), Mohammed Yousif Abu ‘Odah (24), Mustafa Haidar Abu ‘Odah (25), Ahmed Ziyad Al-Sharif (32) and ‘Abdel Rahim Abu Selmiyah (30). 9/17: Israeli naval forces opened fire off the coast of northern Gaza, moderately injuring fisherman Jom’aah Zayed, 69, with a bullet to his right leg. He had been waiting for his sons on the shore near al-Sudaniya. 9/14: An Israeli war ship fired warning shots at Palestinian fishermen off the coast of Gaza City’s Al-Shati refugee camp. 9/12: Israeli navy forces opened fire at Palestinian fishermen off the coast of Beit Lahiya to the north. Fishermen fled the area immediately. 9/8: Israeli warships fired on fishing boats when they touched the six-mile limit, and marked a boundary of five miles — warning the fishermen against crossing over it. This reverses the truce terms. 9/5: Israeli navy forces arrested two Palestinian fishermen near the Waha area off the coast of Beit Lahiya, according to the head of the fishermen syndicate in Gaza. An Israeli military boat intercepted a small fishing boat at a distance of less than two nautical miles off the Sudaniya coast at Beit Lahiya. The Israeli boat opened fire on the fishermen, then dragged them toward the Ashdod Port, where they arrested two of them. The two arrested fishermen are reported to be Mohammed Zayid and Moussa Al-Sultan. 9/3: Israeli gunboats opened fire at Palestinian fishing boats sailing within one nautical mile off the shore of Beit Lahia. Soldiers forced two fishermen, Mohammed Ishaq Mohammed Zayed (18) and Mousa Talal ‘Ata Al-Sultan (24), to jump into the water and swim toward the Israeli gunboat. The men then were arrested and their boat confiscated. 9/2: Israeli forces opened fire at fishermen off the coast of the southern Gaza Strip. Palestinian fishermen told Ma’an News that Israeli warships fired at their boats with machine guns while they were sailing within the agreed-upon six-nautical-mile limit near Rafah. No injuries were reported. 11/23: Israeli forces shot and killed Fadel Mohammed Halawa, 32. He was reported to have been searching for songbirds that nest close to the boundary with Israel, east of the Jabalya refugee camp. The spokesman for emergency services in Gaza reported that Halawa was shot in the back. 11/10: Several Israeli military vehicles accompanied bulldozers that leveled Palestinian land near the Gaza borders in Khan Younis in the southern Gaza Strip. Witnesses said they saw four military tanks and three bulldozers entering Gaza via a gate in the border fence near the Kissufim military base in northeast Khan Younis. The bulldozers, they added, leveled lands about 200 meters from the border fence. Heavy fire was heard during the Israeli incursion, but no casualties were reported. 11/9: Israeli troops stationed on the Gaza border opened fire with machine guns and projectiles at agricultural land to the southeast of Al-Baraj refugee camp. 11/7: Israeli troops guarding the Gaza border fired at a group of protesters, wounding one of them. 9/23: Reuters reported the various parties agreed to resume talks in late October, after the end of upcoming Jewish and Muslim religious holidays, and allowing time for Palestinian factions to resolve internal differences. 9/19: Several Israeli bulldozers entered the southern Gaza Strip, about 150 meters into the Al-Qarara area near Khan Younis, and leveled Palestinian land. Humanity for Palestine (H4P) is an online global citizen’s action collective, whose goal is to plan, implement, support and coordinate concrete positive actions in support of Palestine, Palestinians, and the search for a just and lasting Middle East peace. It seeks move from talk to action by facilitating the participation of people of all backgrounds, skills, interests and time constraints in meaningful actions in support of Palestine, helping to directing their time and energy toward where it can impact most.